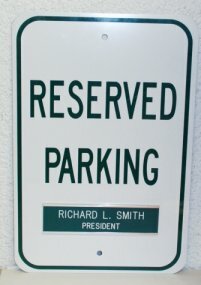 Need a special sign for your parking lot or garage? Want to mark road entrances or exits? Trying to control parking? 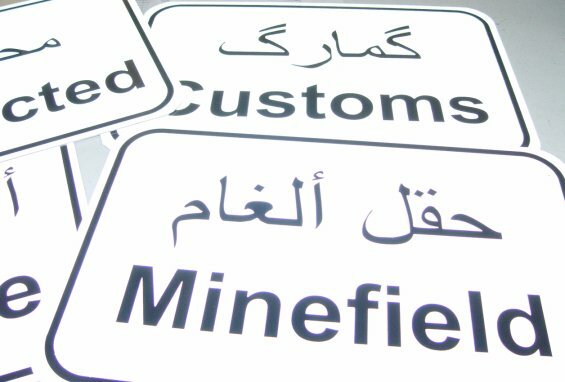 Our highly-visible, highway-grade aluminum signs are your solution. They mount on standard metal poles (we have those too!) and will provide years of service. 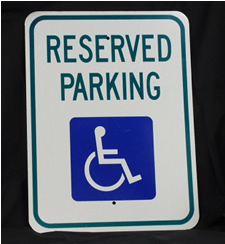 You'll find that having us create a sign to your specifications will be quick and inexpensive. Need a bilingual sign? Just let us know: we do those too! Comical or serious, colored background or white, logos from line drawings, your imagination is our only limit. We do all kinds and all quantities. 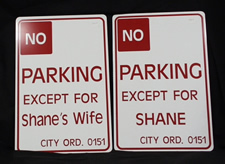 At the top and bottom of this page are our own parking lot signs. These were installed on July 1, 1999 and at the time of this photo, they'd been outside in 5 years of atrocious Northern Maine weather including ice storms, hail, and blistering sun including one winter with record snowfall. (Yes, we do have summers in Maine. Last year it was on August 16th!) Despite this - as you can see - they still look fresh and vibrant. We took these pictures on May 30, 2004. The photos weren't retouched and no washing or cleaning of the signs occurred. Fax us your design and we'll be happy to give you a quote. We can also provide the posts if you wish. They're easily installed and FAR less expensive than you might think. One or a hundred, we produce them to YOUR specifications!